He’s shared a stage with Michael Schenker, joined forces with Def Leppard’s Joe Elliott and wowed fans as Ricky Warwick’s wingman. Joe Walsh, Huey Morgan and Brian Robertson all rave about one of the North East’s most talented sons. And Tom Jones and Eartha Kitt are just two of the stellar musicians to perform alongside one of the most popular guitarists on the live circuit. But one band remains closest to the heart of rock’s go-to guy Paul Guerin. That band is the Quireboys. Other collaborations come and go but it’s now a decade since Paul answered the call from fellow Geordie Spike and began living his ultimate rock n roll dream. Back in 2003 the Quireboys appeared to be the perfect fit with a new focus and a determination to repay the faith of their intensely loyal fans. And Paul admitted: “It was a very natural situation to walk into. I’d been friends with the band for years and I already knew all the songs. 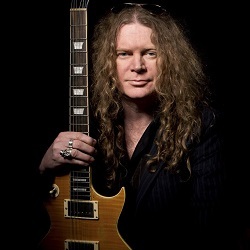 “I’d just played with Spike on his solo record and there was a chance to make an album and tour with Quireboys. In that time Paul has forged one of British’s most potent blues rock partnerships – standing toe to toe with fellow guitar hero Guy Griffin as the melodic heart of the Quireboys. Their mutual respect, endearing friendship and shared sense of humour have underpinned critically acclaimed albums Well Oiled, Homewreckers And Heartbreakers and 2013’s brilliant Beautiful Curse. And the Guerin-Griffin axis looks set to drive the band forward into a brave new era with both guitarists in the form of their lives. “I’ve been lucky enough to play with a lot of great bands and a load of talented musicians over the years,” added Paul. “Very, very lucky.